Production: Chaumiane (Paris) and Filmstudio (Rome); black and white, 35mm; running time: 98 minutes (some sources list 100 minutes). Released 1965. Filmed January through February 1965 in Paris. Producer: Andre Michelin; screenplay: Jean-Luc Godard, based on a character created by Peter Cheyney; assistant directors: Charles Bitsch, Jean-Paul Savignac, and Helene Kalouguine; photography: Raoul Coutard; editor: Agnes Guillemot; sound: Rene Levert; music: Paul Misraki. Cast: Eddie Constantine ( Lemmy Caution ); Anna Karina ( Natasha von Braun ); Howard Vernon ( Professor von Braun ); Akim Tamiroff ( Henri Dickson ); Laszlo Szabo ( Chief Engineer ); Michel Delahaye ( von Braun's Assistant ); Jean-André Fieschi ( Professor Heckell ); Jean-Louis Comolli ( Professor Jeckell ); Alpha 60 ( Itself ). Awards: Best Film, Berlin Film Festival, 1965. 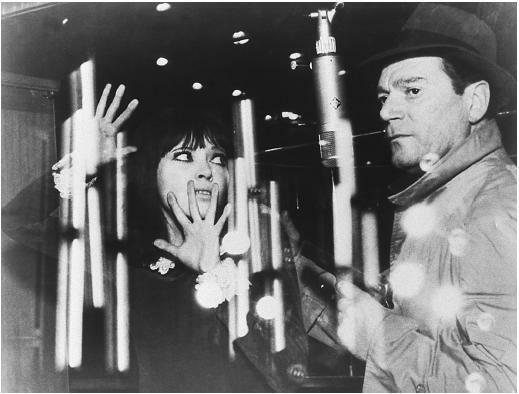 Godard, Jean-Luc, Alphaville , London, 1966; New York, 1968. Roud, Richard, Jean-Luc Godard , New York, 1967. Mussman, Tony, editor, Jean-Luc Godard: A Critical Anthology , New York, 1968. Cameron, Ian, editor, The Films of Jean-Luc Godard , London, 1969. Collet, Jean, editor, Jean-Luc Godard , New York, 1970. Brown, Royal, editor, Focus on Godard , Englewood Cliffs, New Jersey, 1972. Godard, Jean-Luc, Godard on Godard , edited by Tom Milne, London, 1972; revised edition, New York, 1986. Farassino, Alberto, Jean-Luc Godard , Florence, 1974. Parrish, James Robert, The Great Spy Pictures , Metuchen, New Jersey, 1974. Monaco, James, The New Wave , New York, 1976. MacCabe, Colin, Godard: Images, Sounds, Politics , London, 1980. Lefèvre, Raymond, Jean-Luc Godard , Paris, 1983. Bordwell, David, Narration in the Fiction Film , London, 1985. Weis, Elisabeth, and John Belton, Film Sound: Theory and Practice , New York, 1985. Loshitzky, Yosefa, The Radical Faces of Godard and Bertolucci , Detroit, 1995. Dixon, Wheeler W., The Films of Jean-Luc Godard , Albany, New York, 1997. Sterritt, David, Jean-Luc Godard; Interviews , Jackson, Mississippi, 1998. Sterritt, David, The Films of Jean-Luc Godard; Seeing the Invisible , New York, 1999. New Yorker , 21 August 1965. Roud, Richard, "Anguish: Alphaville ," in Sight and Sound (London), Autumn 1965. Jacob, Gilles, and Claire Clouzot, in Sight and Sound (London), Autumn 1965. Mekas, Jonas, in Village Voice (New York), 16 September 1965. Coutard, Raoul, "Light of Day," in Sight and Sound (London), Winter 1965–66. Sarris, Andrew, in Village Voice (New York), 3 November 1965. Bond, Kirk, in Film Society Review (New York), March 1966. Gow, Gordon, in Films and Filming (London), May 1966. Thomas, John in Film Quarterly (Berkeley), Fall 1966. Federman, Raymond, "Jean-Luc Godard and Americanism," in Film Heritage (Dayton, Ohio), Spring 1968. Nolan, Jack Edmund, "Eddie Constantine," in Films in Review (New York), August-September 1968. Crofts, Stephen, "The Films of Jean-Luc Godard," in Cinema (London), June 1969. Kozloff, Max, in Film Culture (New York), Winter/Spring 1970. Ropars-Wuilleumier, Marie-Claire, "Loss of Language," in Wide Angle (Athens, Ohio), no. 3, 1976. Maclean, R., "Wittgenstein and Godard's Alphaville ," in Sight and Sound (London), Winter 1977–78. Blanchet, C., in Cinéma (Paris), May 1983. Pinciroli, G., "La completezza del gesto in Alphaville ," in Cineforum (Bergamo, Italy), December 1989. Darke, Chris, "It All Happened In Paris," in Sight & Sound (London), vol. 4, no. 7, July 1994. Castoro Cinema , no. 176, March-April 1996. Brown, R.S., "Alphaville," in Cineaste (New York), vol. 22, no. 1, 1996. Marek, Petr, in Film a Doba (Prague), vol. 42, no. 4, Winter 1996. Since the early 1950s a tendency has begun to manifest itself in the genre of the science-fiction film as an increasing number of important directors use the sci-fi form to express their views on society, mankind, the present and the future. One of these is Jean-Luc Godard, whose 1965 Alphaville takes place in a utopian world of the future. Godard's world is not one of joy and happiness; Alphaville is governed by a totalitarian system in which the individual counts for almost nothing, and its alienated people have no use for art, love, or even thought. People are reduced essentially to the level of robots, identified only by numbers, without a will of their own, with no ideas or feelings. Even though it belongs in the category of science fiction, Godard's film does not closely follow the conventional patterns of the genre. As a member of the French New Wave, Godard has held, since his debut, an individual and well-defined view of the cinema. One of the most important features of his work is his emphasis on the contemporary world. All of his films deal with modern man; we do not find a return to the past in his entire work. The stamp of the present can also be seen in his sole excursion into the future. Alphaville , which is less about what the world will be like tomorrow than what it is like today, and what it is gradually becoming before our very eyes without our realizing it. In the present and the past Godard sees the potential seeds of a future world, and therefore the story has an admonitory subtext. From this thematic interpretation flows the film's realization, its formal execution and visual aspect. The viewer encounters on the screen nothing that appears to be unusual or extraordinary, and Godard even forgoes any futuristic mise-en-scène. His Alphaville of the future is the Paris of 1965, in which a dehumanizing atmosphere is expressed through the camera work of Raoul Coutard, who shoots buildings of concrete and glass in high contrast, alternates positive and negative images in very short takes, and makes particularly effective use of Paris by night. The most unusual aspect of the film is the sound, particularly the monotonous voice of the central brain governing Alphaville, a voice in contrast to the somewhat ingratiating music of Paul Misraki. A characteristic feature of the entire French New Wave was a certain admiration for the American cinema—its perfect craftsmanship and its ability to entertain, move, or thrill with suspense. In Alphaville , Godard's affinity for popular film can be seen, for example, in the choice of Eddie Constantine for the starring role— viewers know him chiefly from gangster films—and in the dramatic structure influenced by both film serials of the 1930s and by comic strips. Another striking feature of Godard's direction is his free use of ideas and resources borrowed from other films and other art forms; Godard summons these according to his own needs. In Alphaville we find links with the work of Jean Cocteau in the sequence in which Lemmy converses with Alpha 60; the labyrinthine passages recall the phantasmic world of the novels of Franz Kafka; and we find a reference to the ancient myth of Eurydice and the Biblical story of Lot's wife. There are also references to the unforgotten Fascist past, as in the tattooed numbers worn by the city's inhabitants, the name of the designer of the central brain, Professor von Braun, or the use of actual rooms of the Parisian Hotel Continental, where the Gestapo was quartered during the Occupation. These references in the film are not incidental; they are utilized intentionally to broaden and deepen the picture and shift the story to another, more relevant level. However, they do not destroy the integrity and unity of the film even when the viewer is aware of them. Godard's films of the 1960s were often received by a portion of the public and by some critics with an enthusiasm that was almost excessive. In the course of time, some of these films have lost their appeal. This has not happened in the case of Alphaville , which remains part of a valuable current of science fiction while holding its place in the history of cinema.